Bhavan Ottapalam Kendra was established in 2005. As with all Bhavan's premier institutions across the length and breadth of the world, promoting value based education, culture and peace has been the foremost vision of the founding members of Ottapalam Kendra. Bhavan's Ottapalam Kendra started off with two premium institutes viz. 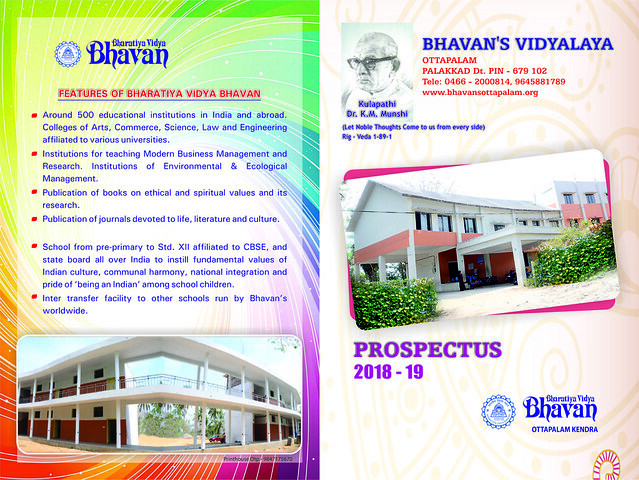 Bhavan's Vidyalaya and Bhavan's Classical Academy. The intention was to keep up with the highest standards of excellence in the spheres of education, art and culture. The result has been the creation of a professionally managed school catering to the social, cultural and academic needs of the next generation of society of Ottapalam. All efforts are taken to develop the child's cognitive and motor skills right from the kindergarten level. The curriculum is as per the Central Board of Secondary Education (CBSE) and as adopted by Bharatiya Vidya Bhavan. With a view to develop a state of the art school campus, 3 acres of land in a scenic location has been purchased near Veetampara within the limits of Ottapalam Municipality . In fact, this could be the first green school in Kerala !! Copyright © Bharatiya Vidya Bhavan, Ottapalam Kendra 2010 - 2014.